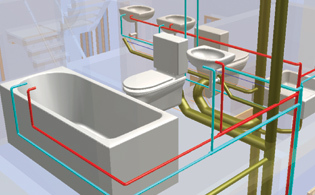 AX3000 is a software solution for integrated planning of the trades Heating, Ventilation, Sanitary and Electrical. Its innovative control using intelligent objects and the extensive automated analysis bring out the most of your estimated planning time. Modular layout of AX3000 offers you extensive specialized solutions for Heating, Ventilation, Sanitary and Electrical. AX3000 is offered as Allplаn, AutoCAD or BricsCAD solution.